Rich and flavorful Puerto Rican cuisine has been influenced by an amalgam of cultures and flavors. The Spanish and Africans, as well as native Taino and Arawaks, all had their hands in creating what local people call “Cocina Criolla.” Indigenous ingredients were mixed with foreign spices, old methods mixed with new, to create unique flavor combinations, and shockingly pungent, delicious fare. Second count? I live in an area where there are many Hispanic grocery stores. What seems somewhat exotic is often readily available right in my neighborhood. 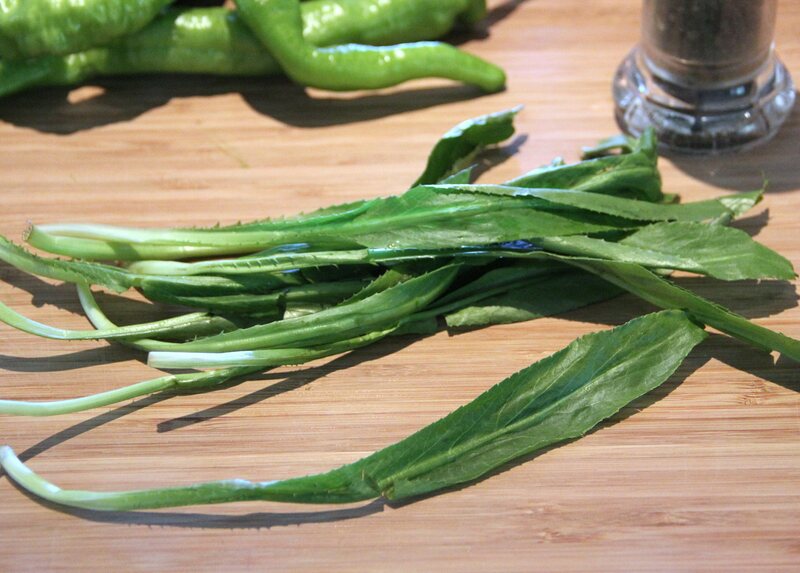 Recao, sometimes called culantro, is a tropical herb at the heart of many Puerto Rican dishes. When blended with sweet and spicy peppers, onions, garlic, and cilantro, it forms the frothy, aromatic recaíto, a Puerto Rican staple used in flavoring soups, vegetables, grains, and meat dishes. This emerald green flavor-packed mix is so versatile. I like to make it in big batches and store extra in the freezer. Many Puerto Rican cooks advise freezing recaíto in ice cube trays, making it simple to melt a cube or two for a recipe. Caution – it’s easy to get hooked on this stuff. Try some in this easy Shrimp Recaíto. Pretty soon you will be slathering it on sandwiches and using it to top off your omelets. Buen provecho! 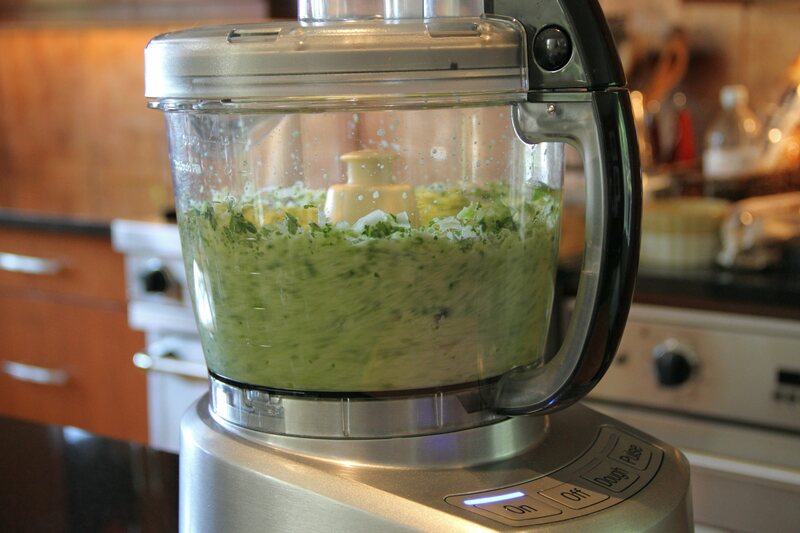 Have a food processor (or large blender) at hand. Peel and coarsely chop onions. Add to food processor. 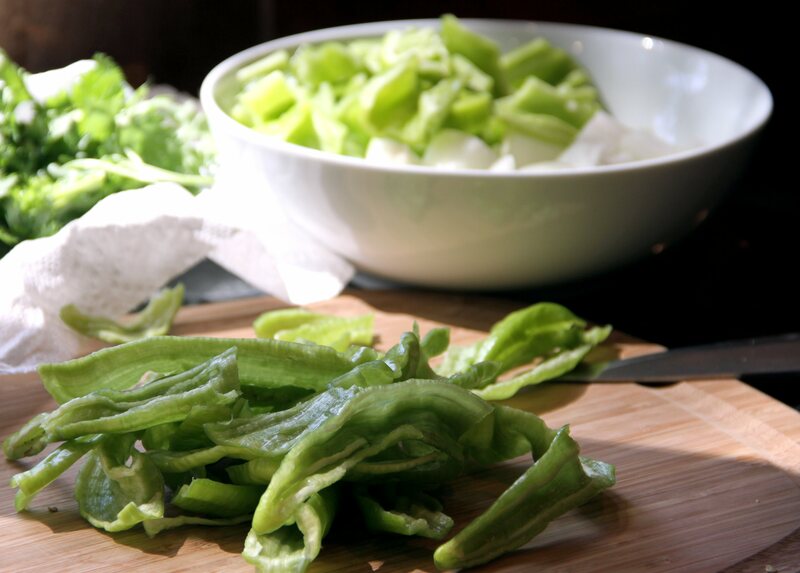 Wash, slice, seed and coarsely chop cubanelles and sweet green chili peppers. Place chopped peppers in food processor. Peel garlic cloves and add to other chopped vegetables. Wash and trim recao and cilantro leaves. Add to food processor. Pulse a few times, or mix on low until mixture is well blended and frothy. Freeze excess recaíto until ready to use. Makes 5 to 6 cups recaíto. * If you cannot locate recao, use 1 ½ to 2 additional cups of cilantro as a substitute. 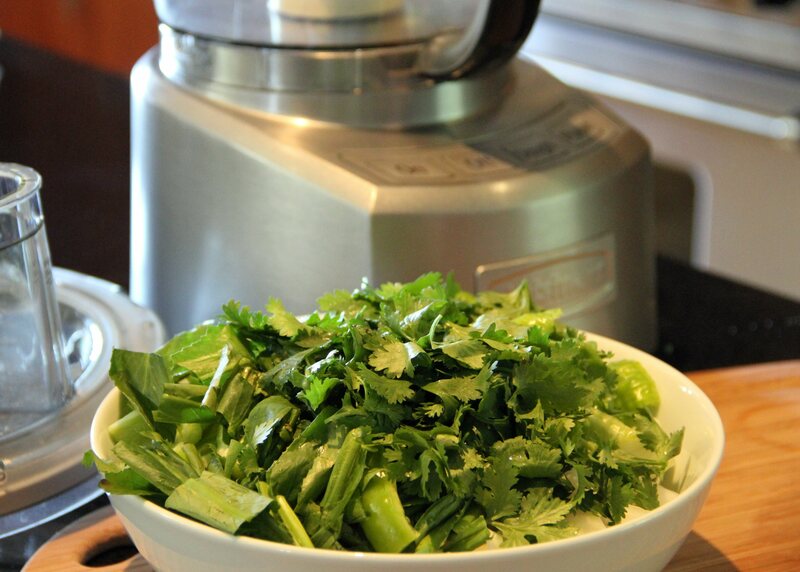 Cilantro is an unrelated plant with a similar, yet more powerful, flavor. Thanks, Jef! Recaíto is simple, fresh, and delicious. Have you tried cooking with it? Yes! Would love to make a big batch and leave it in RC’s freezer for when I want to use it! Thanks Richard! I like your story, too. It’s so fun when you can find chemistry in the kitchen. What do you and your friend like to cook when you get together? And how can I get an invitation to one of those meals? 😉 I hope you try this – I have become very enamored of Puerto Rican food – it’s addictive! Thanks! Feel free to try different peppers. Bells will make a milder flavoring, but make a good substitute. Would love to know if you try it! Ahhh the power and potency of culantro! I’ve been lucky enough to find a nice size bag of it at an Asian Market here in NC, but have fun trying to find it other than in Puerto Rico or some other Latin American country. 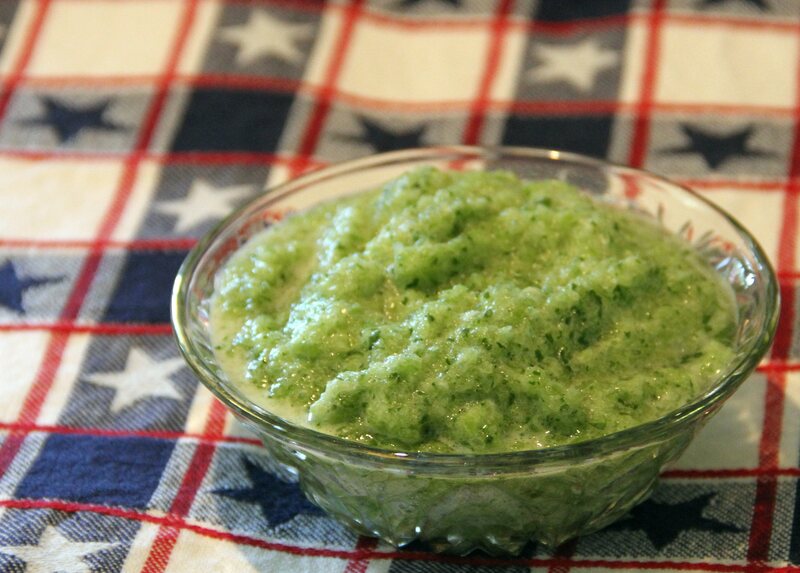 Next time you make a Puerto Rican dish, try making your own sofrito with the culantro. My boyfriend and his family are from PR and their secret ingredient in most dishes is to use your own homemade sofrito for flavoring 😉 great recipe! Stay tuned, I may post a Puerto Rican dish soon! We are fortunate to be living in the NY area, where we can purchase culantro. It is surprisingly inexpensive! But I hear you, that’s why I recommend cilantro as a substitute. 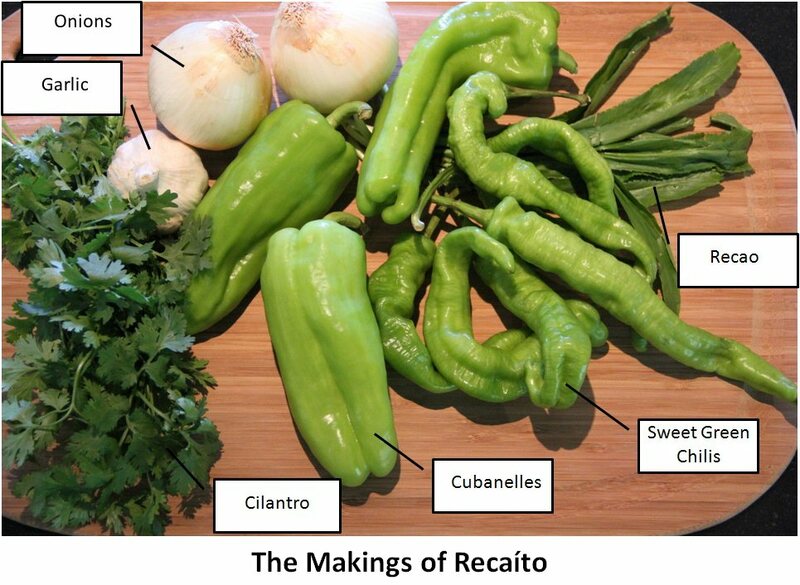 I do make my own sofrito, too, using the recaito as a base. But can’t wait to see your boyfriend’s family recipe! What are your favorite Puerto Rican dishes you like to prepare? OH! How wonderful! Thank you so much for finding MY blog…your is just DELIGHTFUL! I wish to know more…I am here to stay! Read any Puerto Rican or Latin American cookbook and chances are that you will come across sofrito as one of the key ingredients in many sauces, stews, soups, stocks, beans, and rice dishes. Its versatility comes from the fact that in addition to providing dishes with that unique “Latin” flavor, sofrito compliments perfectly the other flavors of the particular recipe.Sofrito is the Latin equivalent of the French “mirepoix”, the combination of onions, celery, and carrots that is the base of many of their recipes; or the Southern United States’s “holy trinity”, that combines onions, bell peppers, and celery to produce wonderful dishes like gumbo, étouffée, and jambalaya. Thank you so much for that very informative response! I love sofrito! oh my god oh my god oh my god. I WISHED I could recreate this here in Germany. I am so incredibly intrigued by this too!! Culantro… never heard of it before and wonder how much time will pass until I am able to taste it. In Germany it is sooo hard to get hold of anything exotic. Loved this post Alison! Danke! We are very fortunate to live in an area where so many ethnic ingredients are close at hand. If you can get cilantro in Germany, it makes a good substitute. You have to use a lot, though, because it’s not at potent as recao. sweet green chili peppers seeds. I can’t seem to find this seeds. i want to grow this peppers thank you. you mention. Well I’m from Chicago but I have a green house to grow this all year. Have a great day. How wonderful to have a greenhouse! Good luck, and I hope you’ll check back in to let me know how you made out with your pepper growing.